Moments after the Iolaire ties up at the concrete pier on the isle of Staffa, passengers are scrambling up the narrow aluminum stairs that scale the nearby cliff. They are following directions issued by Davie Kirkpatrick, captain of a wooden vessel that ferries visitors to Staffa from the Scottish islands of Mull and Iona: "Climb the stairs, then go left to the cave or right to the puffins. And remember that the boat leaves on time." Scotland's Isle of Staffa is renowned for its cathedral-like basaltic columns, its colony of puffins, and for being the inspiration for a famous classical music overture. For geologists, birdwatchers and classical music fans, it's a must-see. All photos by Diane Kightlinger. Although the Iolaire's tour runs three hours, the sailing time leaves just 70 minutes to explore this uninhabited chunk of land. Yet Staffa bears a close look: Though just three kilometers around, the island is renowned among geologists, birdwatchers and classical music fans around the globe. If you count yourself among the third group, head left at the top of the stairs. A black cable bolted to the rocks serves as your guideline. Truncated pillars of basalt form steps that lead toward the sea and an opening in the rock. Rounding the corner, climb the final few feet onto a ledge perched inside a sea cave. Overhead, jumbled blocks of broken basalt arch like the ceiling of a Gothic cathedral, then taper to blackness where the altar should be. Colonnades of basalt vault upward, forming massive ridged walls on either side. But for now, forget the geology; you're here for the music. With a favorable interplay of waves and wind, endless lines of swells race through the center of the cave and crash in the darkness far beyond. Cascading down basalt steps, the ebbing waters create a sea song known as the music of Fingal's Cave. Sea swells racing into Fingals Cave and cascading down basalt steps create rhythmic, eerie music made famous by composer Felix Mendelssohn. The columnar basalt formations evident on Staffa emerged as lava flows some 60 million years ago. The island's name came from the Viking or Norse word for building stave, column or pillar. After visiting the cave in 1829, composer Felix Mendelssohn captured these rhythmic, eerie sounds for audiences worldwide in his "Hebridean Overture." Although the cave was previously called Uamh-Binn  Gaelic for Cave of Melody  the name "Fingal's Cave" appeared on Mendelssohn's score, a nod to a mythical Scottish giant. The overture's fame brought hundreds of visitors to Staffa during the Victorian Age, including Sir Walter Scott, Jules Verne and Queen Victoria herself. But no longer. About a decade ago, an article in the bulletin of the Edinburgh-based Grampian Speleological Group described Fingal's as the "most famous but least visited cave in the world." Many catch a glimpse on boat trips to view wildlife in the Treshnish Isles or to visit the well-known monastery at Iona, founded by St. Columba in A.D. 586. But few set foot ashore on Staffa these days. Yet most geology students have seen textbook photos of the isle's surreal basalt formations. Given the endless rows of six-sided columns that comprise the island's cliffs, it's easy to accidentally refer to the geology as "architecture." In fact, the name "Staffa" comes from the Viking or Norse word for building stave, column or pillar. 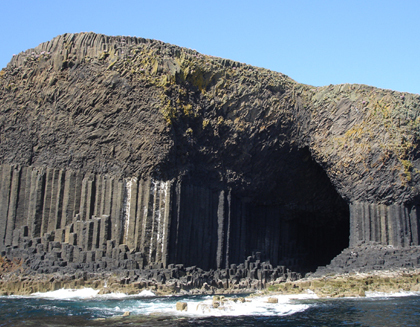 "The basalt layers that form Staffa are the remnants of lava flows some 60 million years ago," says Angus Miller, owner of GeoWalks, a geology touring company based in Edinburgh. "The basalt once covered a wide area of western Scotland, all the way across to Ireland and the Giant's Causeway," he says. The Causeway basalt, located in North Antrim, mirrors the formation on Staffa. Miller says lava erupted from fissures in this vast volcanic field and spread across the landscape, traveling several kilometers from the source. Although the columns within the basalt may look like colossal crystals, they developed after the lava solidified. As the rock cooled and contracted, cracks formed in the most efficient pattern  hexagonal from the bird's-eye view. The resulting columns vary from one to three meters across but appear remarkably uniform. Because the cracks grew perpendicular to the cooling surface, the columns tend to be vertical. 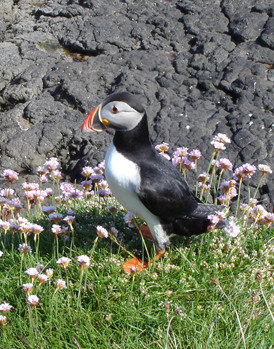 From May to September, a colony of puffins settles on Staffa. Much to the delight of visitors, the puffins seem quite curious about humans. You'll get a close-up look at the columns as you retrace your steps and pass the stairs on your way to the top of Staffa. Stroll across the thatch that crowns the island's cliffs, then head to the northeastern corner to enter the realm of the birdwatchers. While waiting for Staffa's colony of puffins to approach, visitors pass the time identifying the island's many seabirds  guillemot, razorbill, shag and kittiwake. 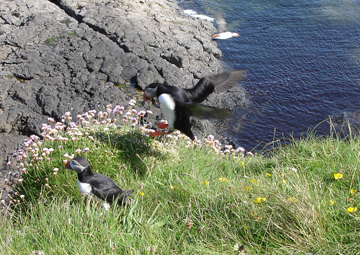 "The puffins have no fear of humans but won't land with gulls flying," Kirkpatrick explains. "If you sit near the cliff's edge to keep the gulls away and wait patiently, they will come." For most of the year, the puffins inhabit the North Atlantic; only from May through September do they come ashore for breeding. They make frequent dives below the surface to fish, pushing the water aside with strong wings. In the air, they're often clocked flying 80 kilometers per hour (50 miles per hour). At times, though, it seems the puffins may as well be decoys. They remain offshore, bobbing serenely on the ocean. Just when you're ready to give up, you'll see an ungainly blur of black, white and orange whizzing past, followed by more in quick succession. Soon dozens of puffins will circle just off the cliff's edge. Then they land, first a few meters away, then a meter, then you're backing away to give them room. Curious and gregarious, awkward on land, they appear as intrigued by humans as we are by them. And when you leave, their perpetually sad eyes make them seem sorry to see you go. With webbed orange feet, colorful triangular beaks, yellow rosettes at the corners of their mouth, and sad hazel or brown eyes, puffins earn their nickname "clowns of the sea." Even a short trip to Staffa offers a range of delights, but those do not include facilities of any kind. In this case, "none" truly does mean you won't find so much as a Port-a-loo. Take or wear warm, waterproof clothing and footwear  there's a reason Gaelic has so many different words for rain. Although the weather could be sunny and in the 70s, it's just as likely to be plowtery (showery) or attery (stormy) or dreich (wet, dismal)  and that's in the summertime. You'll also need to carry food, water and anything else you can't do without for a few hours. The nearest international point of arrival for Staffa is Glasgow Airport in Scotland. From there, take the train from nearby Paisley Gilmour Street Station (accessible by taxi or bus) to the ferry terminal at Oban. Alternatively, rent a car and drive to Oban, just over two hours away. In Oban, board the Caledonia-MacBrayne ferry, which crosses to the Isle of Mull in about an hour and runs several times each day. Finally, drive or take a bus to Fionnphort or Ulva Ferry, the ports from which boat tours leave. You can also take a tour from the Isle of Iona. Mull and Iona both offer a variety of bed-and-breakfast accommodations. Although ferries to Mull and Iona run year-round, the best time to visit Staffa is from May through September. The puffins are in residence and the chance is better for weather that will let boat tours operate and visitors avoid becoming drookit (drenched). Better weather correlates with higher prices and greater numbers of fellow tourists, of course. Kightlinger is a Portland, Ore.-based journalist and essayist, who has written for The Washington Post, The Chicago Tribune, Backpacker, Discovery and other publications. She earned a geology degree from the University of Maryland.